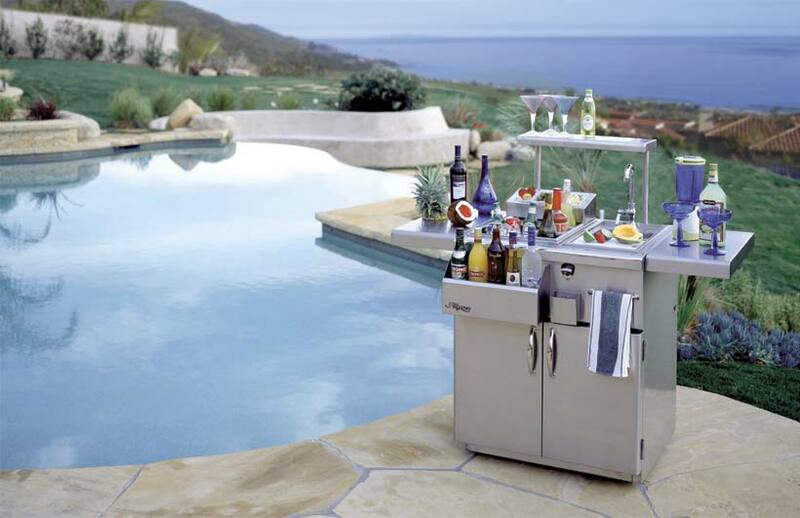 This Alfresco 30-inch bartender with sink on cart is an essential for outdoor entertaining and is maxed out with bartending must haves. The 30-inch bartending center features an insulated ice compartment with sliding cover, convenient bottle wells for chilling cold beverages, front speed rail for easy bottle access, a sink with removable cutting board, a bottle opener with cap catcher and a decorative towel rack. Constructed of 304 stainless steel with heli-arc welded seams for long-term durability with hand-polished accents to perfectly match the rest of Alfresco's line of outdoor kitchen products. While Alfresco take grilling very seriously, they also understand that outdoor entertaining is supposed to be fun. Their line of professional bartending centers is the largest in the industry and was designed by real professionals to include all of the essentials for producing the perfect libation. We truly appreciate that you have chosen to purchase a Alfresco and we want to help you protect your lifestyle enhancing investment. That’s why we back our products with one of the most comprehensive warranties in the business and why it’s so important to complete the Product Registration And Confirmation of Ownership form.